The Wee Fox is a member of my latest series called the Wee bits. 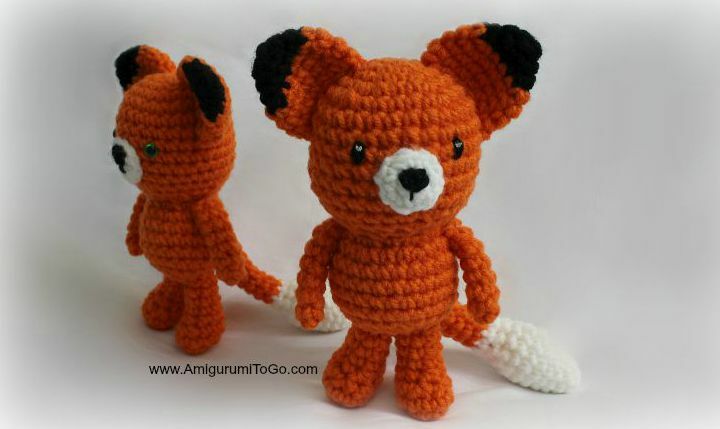 You can pick up the other animal pattern links in one post here they all have full video tutorials to go with the written patterns. 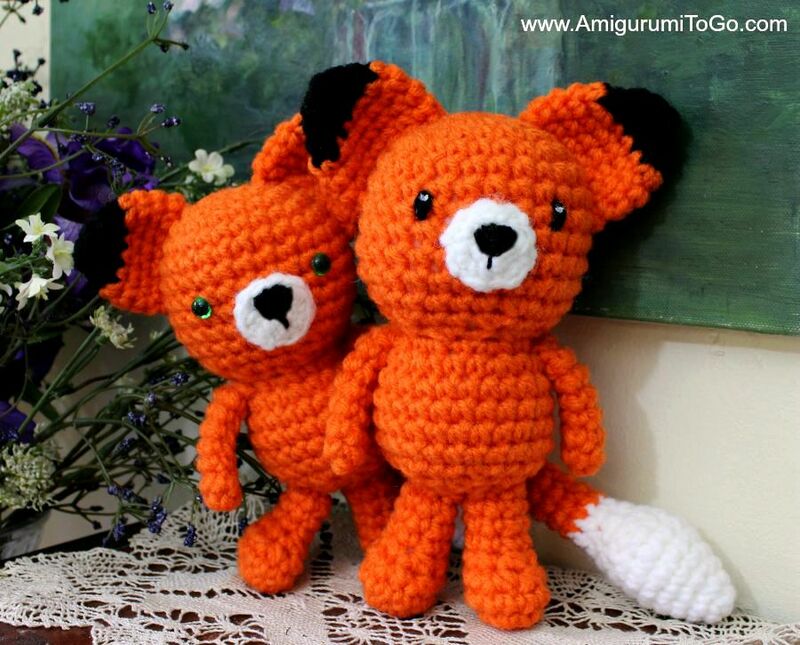 Scroll down this page for the fox pattern. Red Heart Comfort yarn in Tango 3232 for the body, a small amount of black for the tips of the ears, and a small amount of white for the muzzle and tip of the tail. you can use felt, buttons, yarn or paint eyes on. I used 7.5mm safety eyes in between the 8th and 9th row for one fox and yarn wrapped around the 8th row for the other. Click here for the Wee Fox video. We make the parts in this order: Ears, Muzzle then tail followed by how to sew it all together plus add in yarn eyes. sl st next st and f/o leaving a long tail for sewing. Do not stuff. Pin the ears on before sewing them in place. Please view the video for the best results. sl st next st and f/o. Whip stitch a nose in before sewing muzzle to the head. I hot glued the muzzle onto the face of the wee bear (not pictured) which works great for me. If you choose to do the same, make sure to not add so much glue that it oozes out onto the face because you won't be able to get the glue off. If you sew it in place, put 4 pins in to ensure it does not move around while sewing. Again, the video will walk you through this part if there's any difficulty. The yarn eyes are wrapped around the 8th row with 5 visible stitch holes between them. I then dabbed white paint on them to give the eyes a bit of life. works great! 20) fold end flat, ch1 and crochet through both sides closing up the edge f/o leaving a tail for sewing. 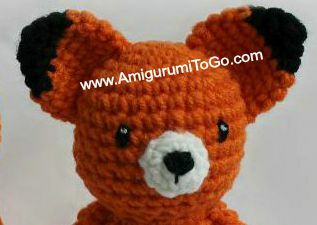 Remember to post pictures of your finished wee animal on my facebook page, Amigurumi Freely, I'd love to see! This little fox is so cute with his black eartops. I love your Wee serie. sharon, I have made all of your animal patterns but have trouble posting photos. Thank you so much-I'm loving each one. (giraffe and lion might be favorites) Starting the wee ones now. Thanks again. Have to say they are my favourites too. So enjoyed making them !!! Multumim mult ca impartasiti cu noi realizarile dumneavoastra!!! I love all the wee bits! So far I think the fox is my favorite! So cute. By any chance, are you planning to include a squirrel, mouse or monkey? I'm not demanding though! LOL Your generosity is so amazing. Your animals make me smile! lol all those have crossed my mind. I don't know when I'd get to them though. I'll be adding to this series for sure, over time. I was wondering if you could think of an alpaca amigurumi? I do craft shows and my little shop is called Alpaca Amigurumi and I need a mascot! Hehe. hello, I have been following you on your channel and I love all your work..I was wondering if you have a pattern for a cat and dog?